Highly recommend Crecraft for Tree Craft they are very accurate and work very fast. After 3 hours nothing was left from our huge 50ft Pine tree at our backyard! It was very old and dangerous but these guys really know what to do! We were extremely pleased with the service provided! The over all result of our trees is better then we ever imagined and we look forward to using your company again in just a few months. Thank You! Thank again for all your help, we will definitely recommend you to all our friends. We appreciated you taking the time to explain everything and answer our questions. I am sure we could never find anyone as knowledgeable you! 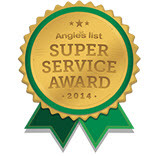 Crecraft for Treecraft has earned the service industry's coveted Angie's List Super Service Award for a second year in a row! This award reflects another exemplary year of service provided to members of the consumer review service in 2014. "Only about 5 percent of the companies Crecraft for Treecraft competes with in the Mainline, PA are able to earn our Super Service Award", said Angie's List Founder Angie Hicks. "It's a mark of consistently great customer service." Crecraft for Treecraft has earned the service industry's coveted Angie's List Super Service Award, reflecting an exemplary year of service provided to members of the consumer review service in 2013. "Only about 5 percent of the companies Crecraft for Treecraft competes with in the Mainline, PA are able to earn our Super Service Award", said Angie's List Founder Angie Hicks. "It's a mark of consistently great customer service."